First off I would like to say that this plugin is not abandoned. However I may not be able to actively maintain it for a few months. I'm very busy with things at the moment. I would like to point out that landlord is open source on Github. I encourage anyone who sees any issues and feels like putting the effort in to fork it and share their fix with the world. I realize that many of you rely on this plugin and some things may have been broken with the release of 1.9. I apologize for any inconvenience this may have caused and hope the impact it has on your servers is minimal. Hopefully I'll be able to start contributing again soon. Thank you for using Landlord! Protect land, protect animals, protect it all, with Landlord. Landlord aims to keep the minecraft experience simple and fluid for players while also protecting their land. The idea is for this plugin to protect player builds with minimal gameplay interference, while also allowing them to tweak the protection details in a simple and user-friendly way. Players claim land in chunks at a time for a configurable cost. That's all a player needs to do to protect their builds within that chunk. Each area of claimed land will have a very basic permissions system that players can choose to tweak with but also not touch if it isn't desired. The system is based on simple ranks: "Everyone" and "Friends"
Land owners can run a simple command that will open an "Inventory GUI" resembling the table above where users can click each element and toggle the "Yes" or "No" of each perm. Please note that Landlord requires Java 8 to function properly. /land claim (or buy) - Claim the chunk you are standing in. /land friendall <player> - Add specified player as a friend to all your currently owned land. /land list [Page #] - List your owned land. /land info - Get basic information about this current land. /land map - Toggle the land map display. /land reload - Administrative command to reload the landlord config file. /land listplayer <player> - Administrative command to list land owned by specified player. /land clearworld <world> [player] - Administrative command to clear an entire world or all land owned by specified player in the specified world. Clearing an entire world can only be done form the console. landlord.use - Required to use any commands, true by default. landlord.limit.override - Allows unlimited land ownership. landlord.limit.extra - Allow player to own up to "limits.extra" in the config.yml. landlord.limit.extra2 - Allow player to own up to "limits.extra2" in the config.yml. landlord.limit.extra3 - Allow player to own up to "limits.extra3" in the config.yml. landlord.limit.extra4 - Allow player to own up to "limits.extra4" in the config.yml. landlord.limit.extra5 - Allow player to own up to "limits.extra5" in the config.yml. landlord.player. * - Permission for all player permissions below allowed by default for players. landlord.player.own - permission for plot ownership (claim, unclaim, manage, friends, etc.). landlord.player.map - permission to use the land map. landlord.player.info - Permission to use /land info. landlord.admin. * - Permission for all administrative functions (enabled for OPs by default). landlord.admin.unclaim - permission to unclaim land you do not own. andlord.admin.list -permission to use /land listplayer to view other players' land. landlord.admin.manage - Permission to use /land manage and edit permissions on others' land. landlord.admin.clearworld - Permission to use /land clearworld. landlord.admin.reload - Permission to use /land reload. landlord.admin.friends - View friends of anyone's land. landlord.admin.modifyfriends - Permission to add/remove friends of anyone's land. Metrics version You can opt out of sending Metrics by editing plugins/Plugin Metrics/config.yml and changing opt-out to true. People are griefing all the unclaimed chunks in my city server. It's been a long time since the last update... Is this plugin abandoned? 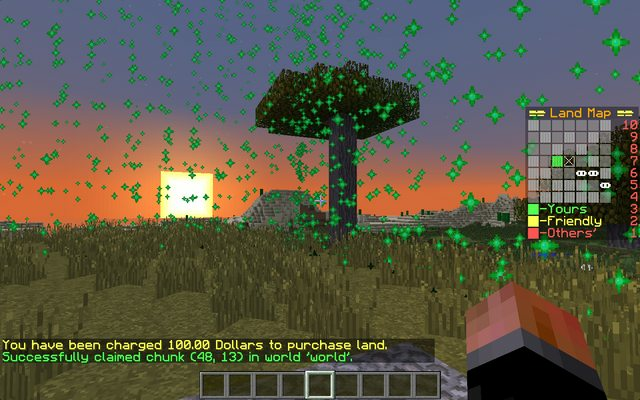 Player ability to place for sale sign with chosen price for other players to purchase chunk or connected chunks. Which would then transfer ownership after sale. Anyway to change the colours of the messages? Can u give yourself chunks to claim as and Admin or you can only claim 1 chunk regardless? Ability to manage ALL claimed chunks, not just each chunk individually. WorldGuard global region override for claimed chunks. My only issue is that I can't find a good economy plugin that's compatible with Vault and not outdated, abandoned, super buggy, or all the the aforementioned. any suggestions? Hello thanks to maintain this excellent software :) I think it need a lot of upgrade. I supported landlord (donation) and i never see any requested changes. - landlord.manage - Permission to use or not /land manage on his land. - /land clearworld must support regen option, keep unclaimed trash chunk isn't a good option sometimes. Info system spam a lot with this entry/exit messages. Some usefull information add to player ! Like number of claim in /ll list command (like i have 5 claims on 50). These are under investigation, I'll get back to you. This is a feature that will be implemented in the near future. This will also be looked at for a release down the road. We added localization support in Landlord 1.4. To add support for French, copy the english.yml file in the messages directory, and translate each message to a french equivalent (without modifying the identifying tag). And there are a ton of them, so maybe throw them into a translator one at a time and make grammar refinements unless you are very comfortable with French. This plugin does require Java 8, but I can investigate and see if a Java 7 release can be deployed or not. I'll get back to you. Does anything in the plugin requires to have Java 8 for it to work? Would it be possible to get a version compiled for Java 7? (I can't change my server java version, and would love to use that plugin!). Thanks a lot.